Announcing the first book about Pinotage!! Pinotage is South Africa’s very own wine, but there has never been a book about it until the Pinotage Club's Peter F May from England decided to tell its story. 2009 is the 50th anniversary of the world’s first Pinotage wine and in PINOTAGE: Behind the Legends of South Africa’s Own Wine author Peter F May tells the story of this uniquely South African grape variety, its creator, Professor Abraham Perold and the people who grow and make Pinotage. During researches in South Africa Peter F May was told information that differed from the standard definition of Pinotage in text books. Turning detective, May investigated various legends about Pinotage's parentage and origins. Peter F May travelled to four continents to interview winemakers and winery owners for the book which details how Pinotage is grown, made and marketed. As well as covering growing, making and marketing Pinotage in South Africa, he provides a comprehensive review of Pinotage in other countries. PINOTAGE: Behind the Legends of South Africa’s Own Wine tells of Peter F May's infatuation with the Pinotage variety and follows his investigations into its origins. After exhaustive investigations into various legends about the variety he identifies when and how it was created and first planted and he discovers the oldest living Pinotage vineyard. The book contains a history of winemaking in South Africa and a biography of Pinotage's creator, Professor Abraham Izak Perold. May investigates various legends about the variety including ones that say it has Shiraz or an American rootstock vine in it parentage and the reasons for Pinotage’s creation. In the second part of the book May discusses growing, making and marketing Pinotage wines with case studies of several classic South African vineyards and wineries. 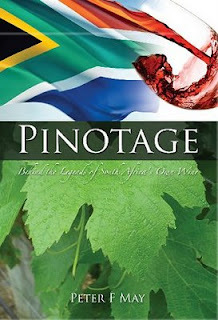 In the third section of the book, author Peter F May takes a look at Pinotage in other countries. His travels take him from South Africa to California and Virginia, Canada, Israel and New Zealand. This timely book is for anyone interested in wine and wine making, and those who want to know the full story about South Africa's wine gift to the world. Peter is a wine writer, educator and author. He is a member of the prestigious Circle of Wine Writers. His first wine book Marilyn Merlot and the Naked Grape: Odd Wines from Around the World was published in summer 2006 by Quirk Books of Philadelphia, USA. Peter F May first visited South Africa in 1996 and he has visited the Cape wine lands on average every year since, spending weeks visiting vineyards and wineries and talking with winemakers and winery owners. In 1997 he founded The Pinotage Club - an international web-based fan club for wines made from the Pinotage variety. 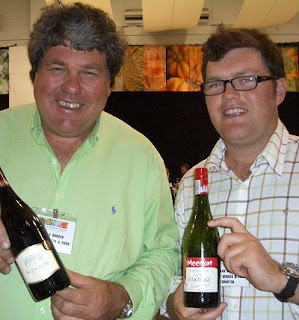 Peter was awarded Honorary Membership of the producers Pinotage Association in 2004 and was a judge at the annual Pinotage Top 10 Competition in 2004 and 2005. US Customers, use button below to pay in US Dollars. Signed book airmailed to you for just $31.25, cheaper than amazon.com! Tony Laithwaite owns the worlds largest specialist home delivery wine business. He started in 1969 loading his van with wines in Bordeaux and selling them back home in the UK. Now his company, Direct Wines, as well as selling wines under the Laithwaites trading name operates wine clubs for American Express, British Airways and The Sunday Times as well as several others, owns Averys of Bristol and Virgin Wines and runs the largest mail order wine business in the USA . So when Tony Laithwaite talks about Pinotage it is worth listening. At the moment he is in South Africa where he enjoyed a braii and "most importantly, I rediscovered Pinotage." "I have tasted a range of styles of Pinotage, each well made and enticing in their own way. From soft juicy, summer fruit bombs of the younger styles to rich, mocha tasting lightly oaked wines with a bit of age. I am loving them all! Perhaps at last South Africa has cracked its red wines - will Pinotage do for South Africa what Malbec has done for Argentina? Only time will tell, but for me, this is a race horse worth backing." I look forward to seeing a larger range of Pinotages on Laithwaites list than the current pair, Stanford Hills Jacksons Pinotage 2006 and Drakenskloof Pinotage 2007 . Stanford Hills gain 4 stars in Platter 2008 but Drakenskloof is a name unknown to me. Laithwaites likes to sell labels exclusive to themselves. It makes it impossible for consumers to compare prices. The winemaker is named as Frans Smit who is the cellarmaster at Spier. Spier make a range of 'own label' wines for UK supermarkets and it is likely this is something similar. 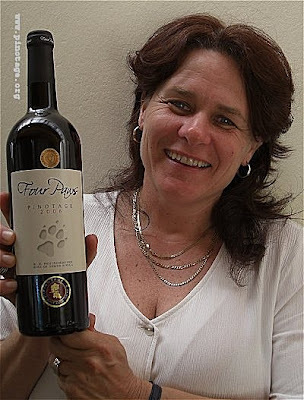 Yngvild Steytler is the public face of Kaapzicht Estate and she travels the world marketing husband Danie's wines. This week Yngvild has been very busy at the London International Wine Fair as the crowds flocked to her stand to taste Kaapzicht's Trophy winning Steytler Pinotage 2006. Kaapzicht's Pinotage beat Shiraz, Cabernet, Merlot etc to the South African Red Single Varietal over £10 Trophy. I managed to get Yngvild's reaction to their win. Her modest reaction was that it was a primarily a win for Pinotage and shows that Pinotage does deserve its place among the world's great wines and that there is a great future for all kinds of Pinotage from rosés and light bodied fruity wines to the full bodied oaked pinotages like Kaapzichts flagship Steytler. I found this wine to be full of ripe fruit, pure and clean and approachable, its two years oak aging is very much in the background. The wine retails in the UK for around £20 a bottle. 2006 Kaapzicht Estate Steytler Pinotage has won this years South African Red Single Varietal over £10 Trophy at the Decanter Wine Awards announced yesterday at the London International Wine Fair. Congratulations to Danie Steytler and his team. Winning Pinotages will be poured at the London International Wine Fair that starts tomorrow 12 May and runs for three days at the Excel exhibition complex on the banks of the Thames river in London's docklands. The Pinotage Association are funding two stands: one will show all 10 winning wines from the 2008 Pinotage Top 10 Competition, the other will show a selection of Pinotages from new and small producers. If you are coming to LIWF make a point at stopping at stands 4 and 20 on the Wines of South Africa island L50 in the centre of the hall. WINE Magazine will be holding a Pinotage tasting in Cape Town on 23 June 2009 and in Johannesburg on 1 July 2009. The wines shown at the seated tasting will be ten top-rated wines as reviewed in the June issue of WINE.